Many used city's relocation ordinance as cushion in finding a new home. Portland has observed a long history of displacing minority families — and it doesn't seem to be halting anytime soon. Almost all of the 18 mostly Spanish-speaking families who faced a massive rent hike after investors purchased a property in Northeast Portland's Cully neighborhood were forced to move out in search of affordable options. That was even following a large organized march in February calling on the Normandy complex's new owner, Ira Virden, to rescind the dramatic increase. Virden, managing director at HFF, a national real estate firm, did not respond for comment for this story. But activists following the situation aren't giving up just yet. 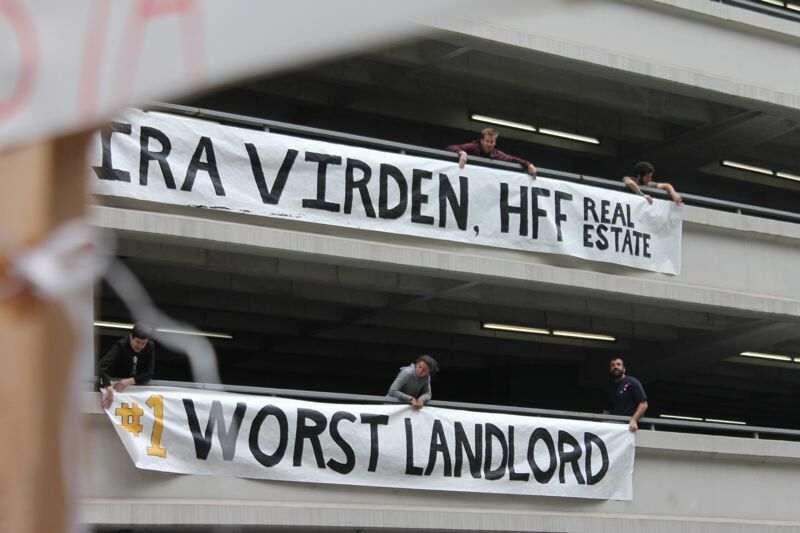 A spoof awards ceremony took place on Wednesday, May 24, shame the man activists are calling the "#1 Worst Landlord." 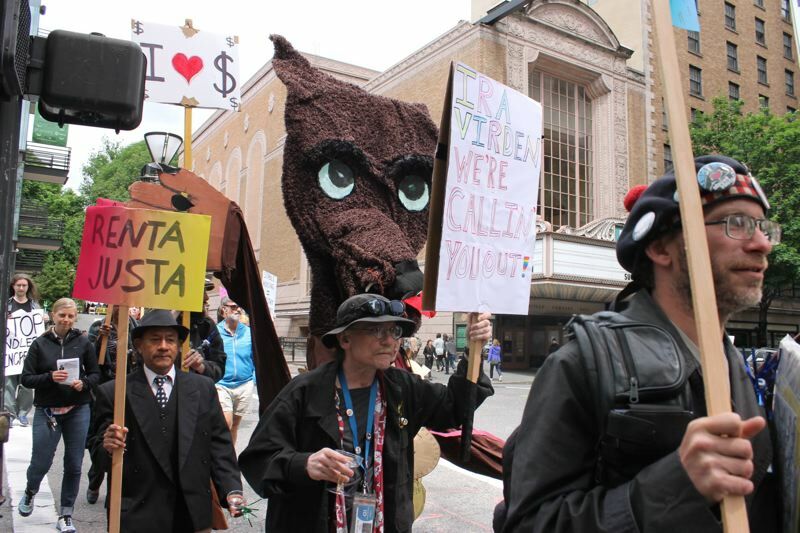 Organizers from Portland Tenants United and Living Cully put together the event, where one person dressed in a giant wolf costume to depict Virden and marched along down to his offices nearby. A smaller separate group went up directly to Virden's office to deliver a bouquet of flowers and read a statement about displacing the families, but he wasn't there. Marchers went into the building at 1000 S.W. Broadway chanting "Ira Virden, shame on you," while others hung giant banners from a parking garage. Things got mildly heated when marchers entered the building and a security guard attempted to prevent entrance to the lobby by kicking a protester. "We want to make (Virden) and his colleagues acknowledge what they're doing to these families," said Cameron Herrington, anti-displacement coordinator with Living Cully. The nonprofit group is a collaboration between four other organizations that are fighting gentrification in the Cully neighborhood, a historically low-income area of the city. The organization has worked closely to help the families in the Normandy complex at 4605 N.E. Killingsworth St., organizing the February march as well as helping at least one family not leave the neighborhood after posting on Nextdoor.com, OPB reported earlier this month. The march calling on Virden to rescind the increase fell on mostly deaf ears; Virden postponed the increase to July 1 to give families more time, but according to Herrington, he then increased it a second time to $1,350, after already increasing it from $620 a month to $1,250 for families in two-bedroom units, which make up most of the complex. Families who've moved were able to use the three-month old Mandatory Renter Relocation Assistance ordinance, where landlords have to pay moving costs for tenants who are forced to move following a no-cause eviction or rent increase of 10 percent or more in a yearlong period. Families from the Normandy complex were actually part of Commissioner Chloe Eudaly's campaign to push for the new city ordinance. "The families are using the relocation assistance based on the new city ordinance, so that's a big help," says Herrington. Living Cully also helped in getting a lawyer involved for the families forced to move. "That's not necessarily helping the families afford a new place in the Cully neighborhood, close to their school, but it's at least kind of easing the burden," he said. Herrington said "the vast majority of families have had to move far from Cully to East Portland." 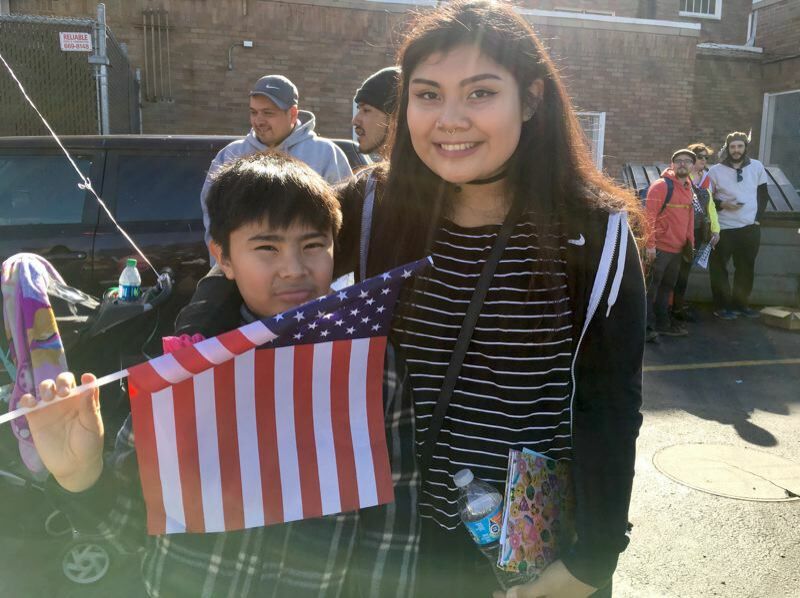 Twenty-six kids in the complex attended the nearby Rigler Elementary School, a dual-language Spanish immersion school. The ordinance mandates payment of $4,200 for two-bedroom apartments, but Virden, according to Herrington, instead of paying the full relocation amount in cash, he gave part of it to families as free rent in April, May and June. The relocation ordinance, established in February, is an emergency ordinance that was enacted partly because of the housing state of emergency declared in October 2015. 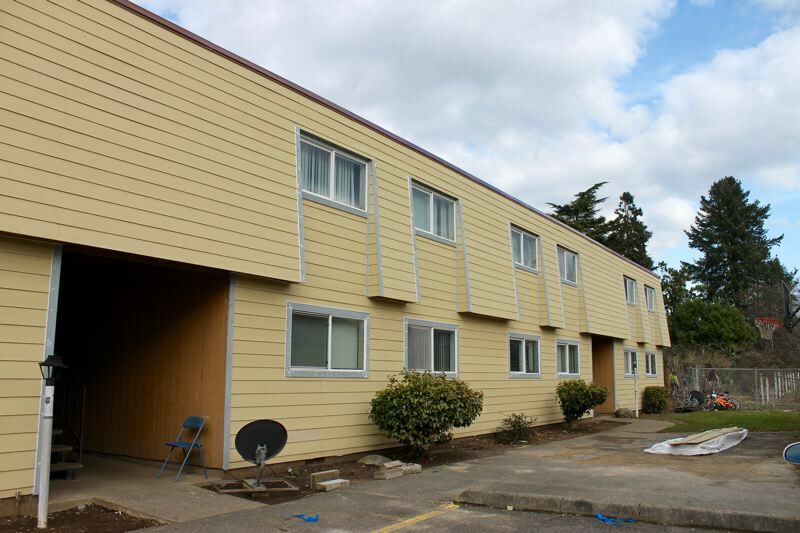 The emergency declaration is scheduled to sunset this October, and at that time the city will reexamine if the relocation ordinance needs to be continued along with the emergency declaration, according to Martha Calhoon, spokeswoman at the Portland Housing Bureau. "We're glad that the relocation ordinance worked. It isn't designed to thwart landlords from doing business, it's designed to protect renters since the owners have made a choice," said David Austin, Eudaly's chief of staff. "We're sorry that they couldn't work something out with the families, but at least the ordinance worked because these families will be compensated." 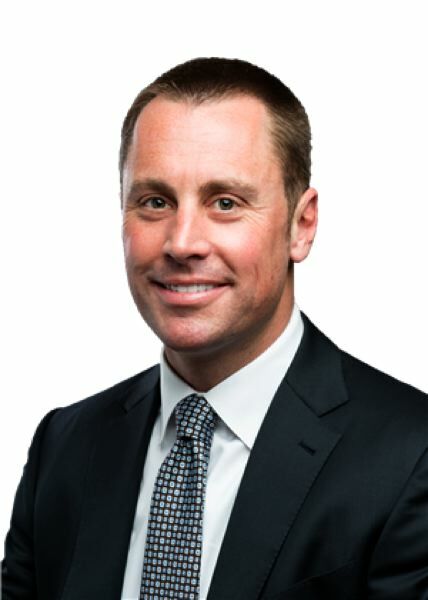 Their office is still hoping to see more preemption from the Legislature — a cause that Herrington is also advocating at the demonstration. House Bill 2004, which recently passed in the House, would allow local governments in Oregon to decide if rent control would work for their community. It would prohibit a landlord from terminating a month-to-month tenancy without cause, except in certain situations with 90 days notice and payment of one month's rent. "We are in a housing crisis and we need to find ways to keep homes affordable so people aren't driven out. As a major city, we want to make sure there are ways we can protect renters," Austin said. Austin says that anecdotally, the relocation ordinance has helped "dozens of families," although since it's a private sector dealing, it's not something that they can easily track. Those looking to use the ordinance are referred to Oregon Law Center and Legal Aid Services of Oregon. Neither agency was immediately able to provide information on how often renters have been reaching out for help. "So if the regulations on rent increases had some kind of basic common sense around how much rents can go up, these 18 families would not be losing their homes," said Herrington. He and other advocates want to keep the Normandy situation in the public eye so that the Legislature will support local jurisdictions enacting rent regulations. Meanwhile, Austin says they're still working. "We're in discussions with the mayor's office and other city commissioners about ways we might help families find affordable housing," he said.